BUY IT Kate Aspen Antiqued Bird Bottle Opener: Looking for something more dainty? This song bird adds refinement, in an antique silver finish with bottle opener tail. BUY IT Star Wars Millennium Falcon Metal Bottle Opener: In a galaxy far, far away, a Star Wars Millennium Falcon comes to save the day – and your thirst. Wrap up this zinc alloy opener as a treat for a friend. BUY IT Arne Jacobsen Cylinda Bottle Opener: Looking more like a designer flute, these stainless steel dreams look a catch beside your beer or soda bottle. BUY IT Spectacle Bottle Opener: A nerdy get-together isn’t complete without a set of spectacles. Add intelligence to your Sunday session, as the rims of these glasses remove the lid. BUY IT Airplane Bottle Opener: Don’t know what to pack in your loved one’s suitcase? Give them travel-themed décor they can use, in the form of this bronze finish plane. 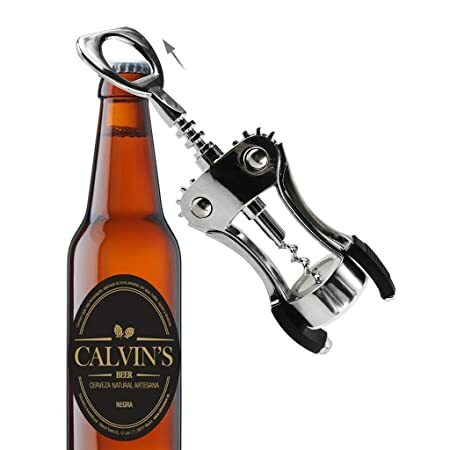 Drinking beer is an activity best enjoyed with friends – and a handy bottle opener. 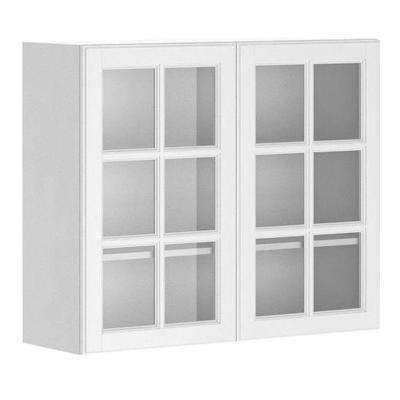 With such a range on the market, why have a boring black, white or metal opener in you drawer – when a bear with snarling teeth can lurk inside your pantry instead? Our top forty bottle openers are innovations that are part drink fixers, part talking points. Collect all your bottle caps, with a magnetic opener that magnetically gravitates towards them. Shoot a gun at your wine bottle to open it – without causing a leak. Drinking a Guinness? Get a Celtic Greenman to take the top off with his mystical glare. Quench your thirst and your appetite for the fun with our nifty list. BUY IT Minimalist Elephant Bottle Opener: Own a bottle opener you’d be proud to show off. This minimalist piece by Jørgen Møller was inspired by a safari in Africa, where the elephant’s sturdy form inspired flicking caps. BUY IT Modern Minimalist Bottle Opener: Open your bottles in style. Soft to the grip and polished by hand, these next-level bottle openers carry a one-year warranty. BUY IT Mermaid Bottle Openers: Dream of a different life under the sea, as this nifty piece of mermaid home décor opens your next drink. Hand-crafted in pewter, her mythological form is good-looking and lead-free. BUY IT Shark Cork Screw & Bottle Opener: Plated in either copper, silver or gold, this nifty accessory surely earns its name as a ‘Hammered Head Bottle’. 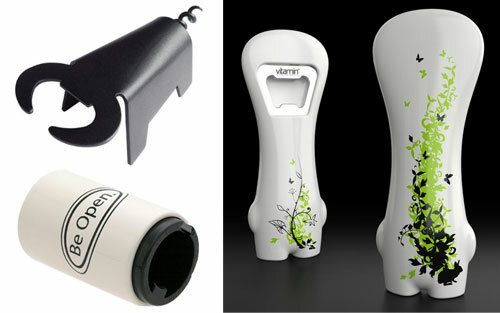 Take off its top to uncork your wine, and soar it towards your beer bottle to lift off the lid. BUY IT Fleur De Lis Bottle Opener: Place your bottle opener next to your soup spoons and ladles, as this Fleur De Lis home décor piece graces the table. Stainless steel and zinc alloy make the standard look elegant. BUY IT Wall-Mounted Skull Bottle Opener: Want to see skulls instead? This zinc alloy, chrome-plated gem adds shine to function. BUY IT Elephant Corkscrew Bottle Opener: Beechwood and stainless steel combine in this Scandinavian piece of elephant home décor. Flip its corkscrew round to signify a tail, and elevate its trunk to lift the cap off your bottle. BUY IT Modern Style Bird Corkscrew & Bottle Opener: For those who like the traditional look, this bird décor bottle opener is only a step ahead. A foil cutter, corkscrew and bottle opener take flight in stainless steel and oak. BUY IT Crocodile Bottle Opener: Opening a bottle in Australia? Make like its native creatures, with a hand-buffed crocodile made from aluminium. The most unique and ridiculous #wine corkscrews out there. 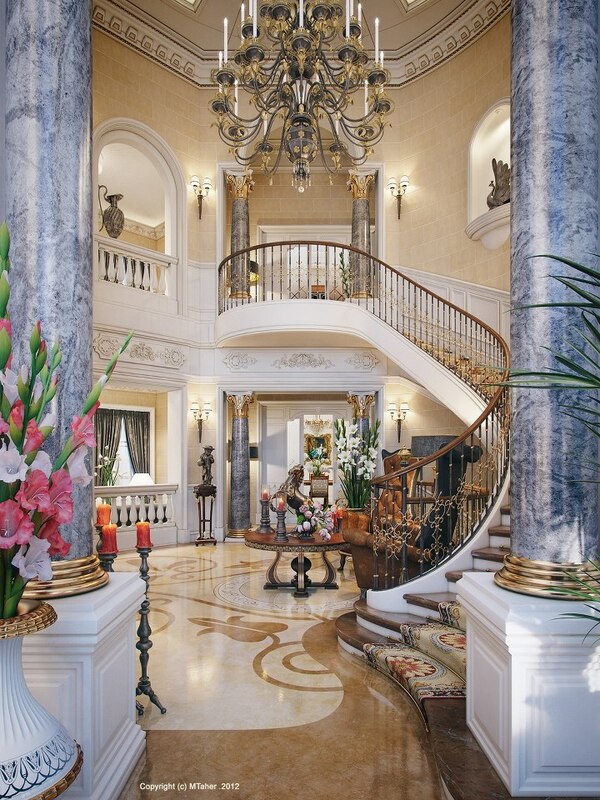 Both antique and new. 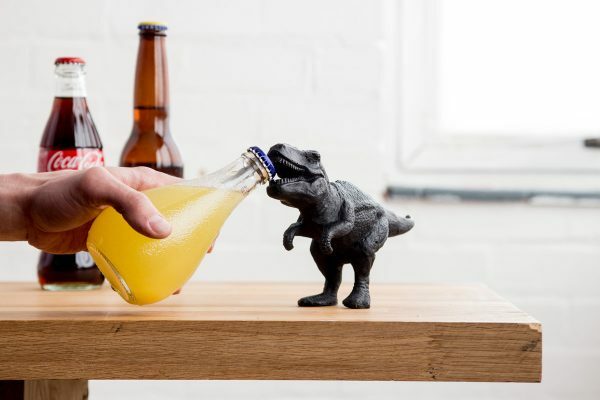 BUY IT T Rex Bottle Opener: Take your bottle opener back to Jurassic times. This cast iron figurine clasps your juice or beer bottle cap between its mighty teeth. BUY IT Bottle Opener Fridge Magnet: Forget about travel souvenirs and advertising magnets – buy a fridge magnet you can actually use. This non-scratch applique attaches to your fridge and magnetically removes your bottle cap, saving you hunting around. BUY IT Personalized Wall-Mounted Bottle Opener: Provide a perfect stop for guests at your wedding or special occasion. This wooden plaque bears you or your celebration’s name, as a metal cup catches the lids. The only thing unaccessible about wine is not having a corkscrew. 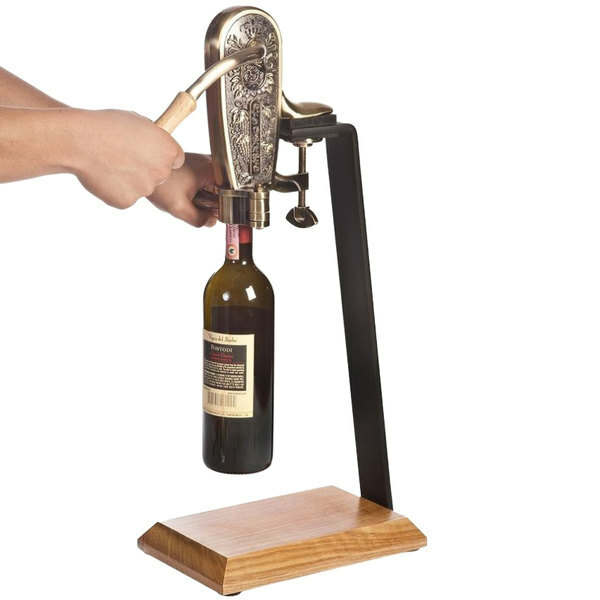 Here are some of the funniest corkscrews we’ve ever seen. BUY IT Wall-Mounted Bear Bottle Opener: A grizzly is something you want to see – but only in the right circumstances. Watch him remove your soda cap, with this cast iron head mounted on the wall. 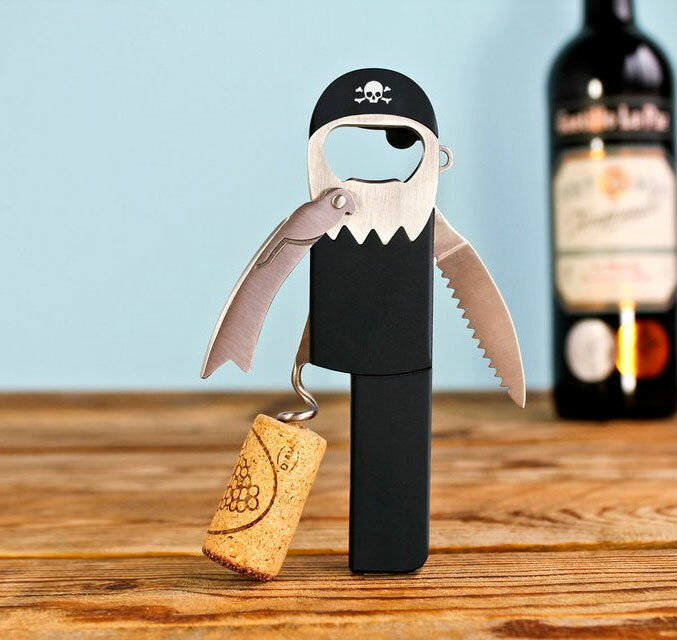 BUY IT Fish Corkscrew And Bottle Opener: Need an under-the-sea creation for every occasion? This feisty fish acts as a corkscrew, foil cutter and bottle opener in white oak and stainless steel. BUY IT Octopus Bottle Opener: Handmade in the USA, this clingy octopus home décor opener is made anew every time. Sculpted in bronze-powder infused resin, it’ll be sure to make a splash at your next dinner party. BUY IT Game Of Thrones-Themed Bottle Openers: Get your Hand of the King in a durable gold finish. This scintillating addition to your Game of Thrones décor might not remain in your possession for long. BUY IT Powered Gun-Shaped Wine Bottle Opener: Want to get trigger-happy? Place a pink or grey gun nozzle over the cork of your wine, for an easy and humorous way to greet guests. BUY IT Open Here Magnetic Bottle Opener: Rather be sitting in an American diner? This retro bottle opener helps you crack open a cold one, whilst magnetically attaching to your fridge. BUY IT Celtic Bottle Opener: Celebrate your Irish heritage with a Celtic claddagh aside your soda. Perfect as a gift, its metal form comes gift-boxed in faux felt casing and paper. BUY IT Wall-Mounted Wooden Bottle Opener With Cap Catcher: Want to designate a place for drinking? Hang this hardwood bottle opener and cap catcher in your man cave or she-shed. BUY IT Dragon Bottle Opener: Breathe fire into your bottle, with this dragon home décor piece astride your wall. Foundry cast iron and a faux pewter finish give it a truly menacing look. Forget something tasteful and boring – if you want something fun to open your wine with, the McLovin Corkscrew is just the ticket and makes a humorous gift! BUY IT Celtic Greenman Wall-Mounted Bottle Opener: Confirm you really are seeing things, with this Celtic Greenman beside the fridge. A bottle or two of Guinness won’t stop his cold-cast resin glare. BUY IT Gothic-Style Skull Bottle Opener: For a more gruesome look, this designer resin skull fits the bill. Nail it to your pantry door to give your Mum a fright. and Alessandro M. are the names of the man and woman corkscrews designed by Alessandro Mendini circa Mendini was part of a group of Northern Italian designers in the who integrated form into function for everyday devices. BUY IT Magnetic Bottle Opener & Cap Catcher: Looking for a place to display the caps? Measure how many you’ve downed, as this magnetic bottle opener forks off and catches the lids. 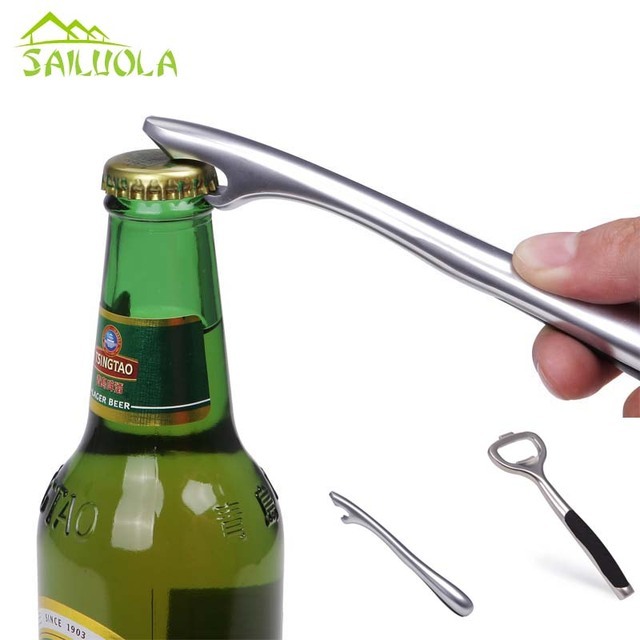 BUY IT Modern Bottle Opener: Remember the days you opened bottles with twigs? Enter the 21st Century, with this bottle opener in polished stainless steel. BUY IT Eagle Bottle Opener: Inject fun into your work drinks with an eagle at the table. This cast iron flyer is sure to beat your colleagues’ poker face. BUY IT Bull Bottle Opener and Corkscrew: You don’t have to engage in animal cruelty to run with this bull. Black-painted steel and a corkscrew tail ensure your guests won’t be waiting for drinks. Alessi presents “Circus”, the Edition Limited Collection inspired by the dreamlike circus atmospheres. Exclusively signed by Marcel Wanders for Alessi. BUY IT Personalized 50 Caliber BMG Bullet-Shaped Bottle Opener: Gun fanatics will love this bottle opener in the shape of a bullet. Personalise it as a gift for the hunter in your life. BUY IT Luchador Bottle Opener: Show your bottle-opening strength with the help of a super-strong Mexican wrestler. This bright blue luchador looks like he’s using his arms – but a handy bottle opener tab hides beneath. BUY IT Multipurpose Card-Shaped Survival Tool With Bottle Opener: Want a bottle opener that can fit in your wallet? This nifty card removes caps, measures length, acts as a flat screwdriver and will never rust or bend. BUY IT Alessi Diabolix Bottle Opener: Feel devilish with this cheeky bottle opener up your sleeve. Available in six colours, its 1994 Biagio Cisotti design is crafted from stainless steel and PA resin. BUY IT More Star Wars-Themed Openers: Rather have Darth Vader, a Stormtrooper, R2D2 or a frozen foe in your hand? These Star Wars home décor openers are the perfect accessory for a nerdy get-together. A hammerhead shark who would rather attack a bottle of beer or wine than a human being. BUY IT Moby Whale Bottle Opener: Add to your nautical home décor collection by housing a whale in your kitchen. It’s crafted from pewter and opens your bottles with ease. BUY IT High Heel Bottle Opener: Love drinking beer, but all things feminine too? Open your bottle with the toe of this heel. BUY IT Vintage Key Bottle Openers: Worried your kids will get into your stash? Disguise your bottle opener as a vintage key, complete with gold-look finish.